So it happened a couple weeks ago now, and I have just been too busy to brag about it. 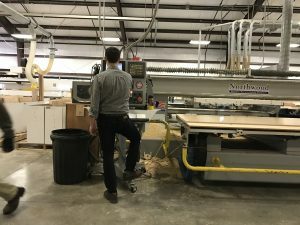 Job #1 was produced, shipped, assembled and installed, and I got a front row seat for most of that. 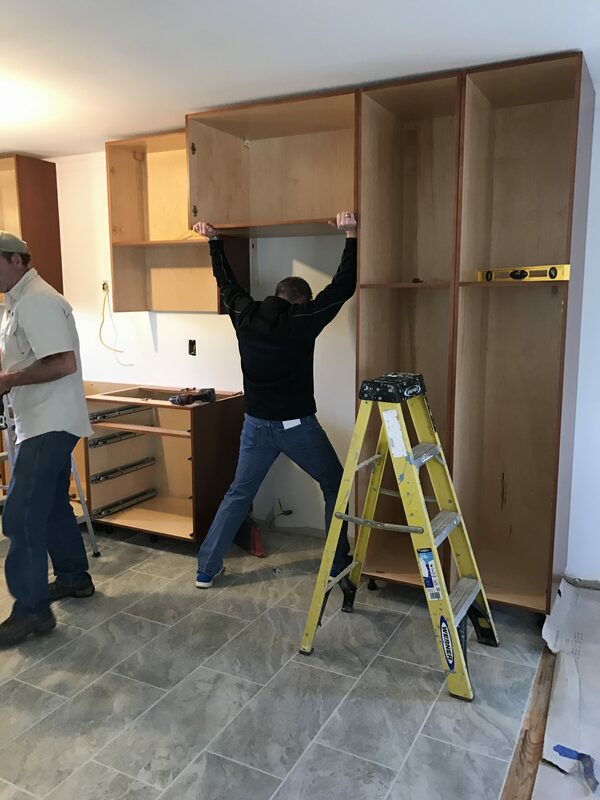 Art Bowling of Envizion Custom Cabinetry in Asheville, NC ordered a U-shaped kitchen based on our brand spanking new Cabinotch Full Access line of cabinetry. It was and forever will be Job #1. 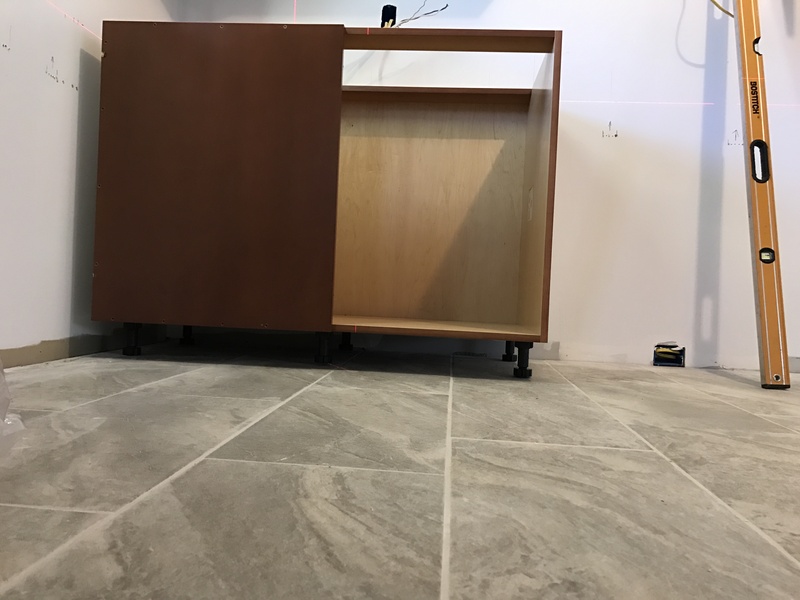 That’s one small step for Art Bowling of Envizion Custom Cabinetry, one giant leap for Cabinotch Innovative Solutions. Job #1 started with a good foundation in that it was designed and engineered using the Cabinotch Full Access Library in KCD (Art Bowling was one of several beta testers). 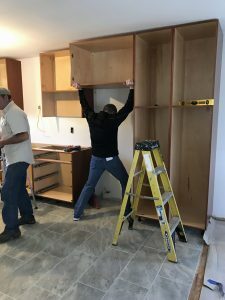 This library is based on the 32mm System, where all cabinetry defaults to “In System”, meaning the default settings for cabinet heights, along with door and drawer front heights are in system. What does In System mean you might ask, to which I must reply, good question. 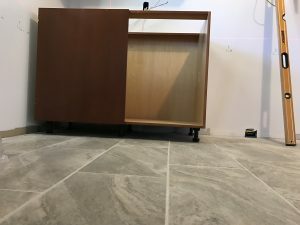 In System means that if you divide the height of the cabinet by 32mm, you will get an even number (e.g., 896 / 32 = 28), or an in system cabinet height. 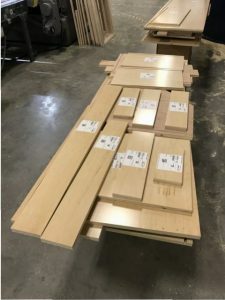 If you take the height of any door or drawer front and add your reveal, then divide by 32, you will also get an even number (e.g., 157 + 3 = 160, 160 / 32 = 5), or an in system door or drawer front. For those not so inclined to stay in system, we have designed the Cabinotch Full Access Library for KCD to be fully parametric. If you go rouge, or off system, you don’t break anything. Your drawer guides and hinges will still work just fine. 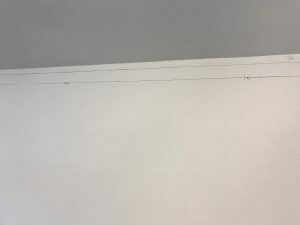 After Art submitted his initial job file, we reviewed it, made a few suggestions, made a few changes and we were off to the races. 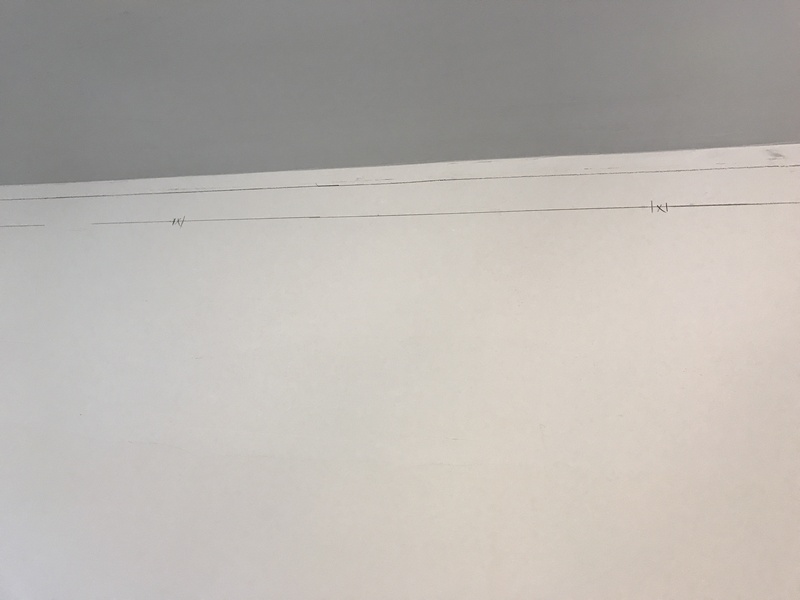 The drawings were reviewed, approved and the job went to production. Here is where the fun starts for those of us that love to watch big beautiful machinery making sawdust. On 03/08/2017, the parts were machined on one of our three Northwood routers. 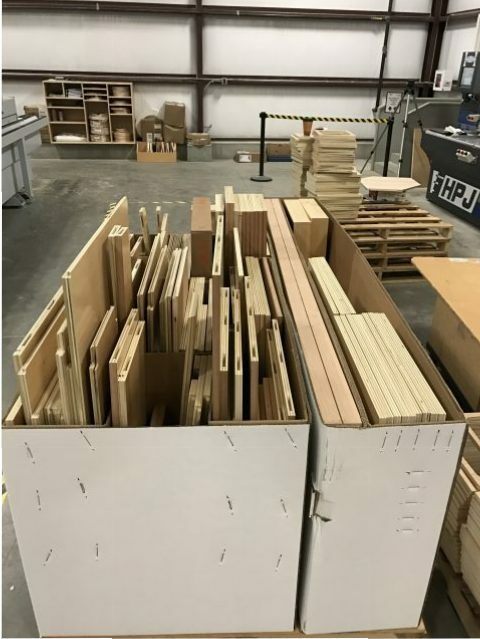 Once machined all parts are then labeled, then the majority of those parts were edgebanded on our Brandt edgebander, and all horizontal parts that needed to be machined for the Lamello P-14 fasteners were machined on our custom made Pillar machine. If you prefer video to the written word, then you might appreciate our Job #1 YouTube page. As parts come off each of these machines, if they are complete, they go into one of our specialty shipping containers, so after the Pillar machine parts are machined, the last of the parts are loaded into the container for shipping. 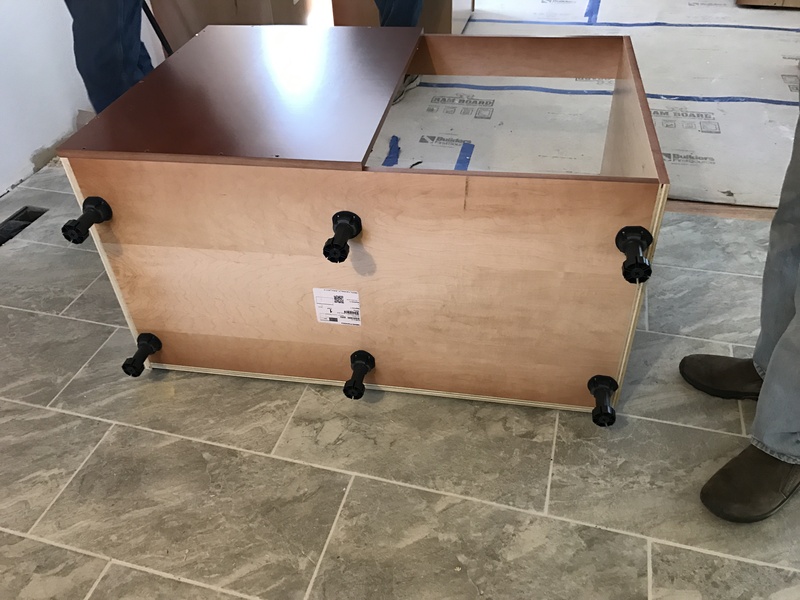 We then add drawer boxes if they will fit (otherwise they are shipped separately), and then all the specialty hardware like hanging rail, suspension blocks, leg levers, drawer guides and last but certainly not least, the appropriate quantity of the Lamello P-14 fasteners. On 03/09/2017 Job #1 was shipped. On 03/13/2017, Art picked his container up at the FedEx terminal (he does this because his shop location does not allow for tractor trailers to deliver there), and he and his guys unpacked his order in preparation for finishing and assembly. On Tuesday, 03/14/2017, Seth Valentine (aka: Seth Weaver, my counterpart for face frame cabinetry and photographer for the day), Rob Wright (our salesman for the Carolina’s territory) and myself met with Art and his team to assist with the assembly. The day went by quickly, and we accomplished a lot in spite of Rob helping out. 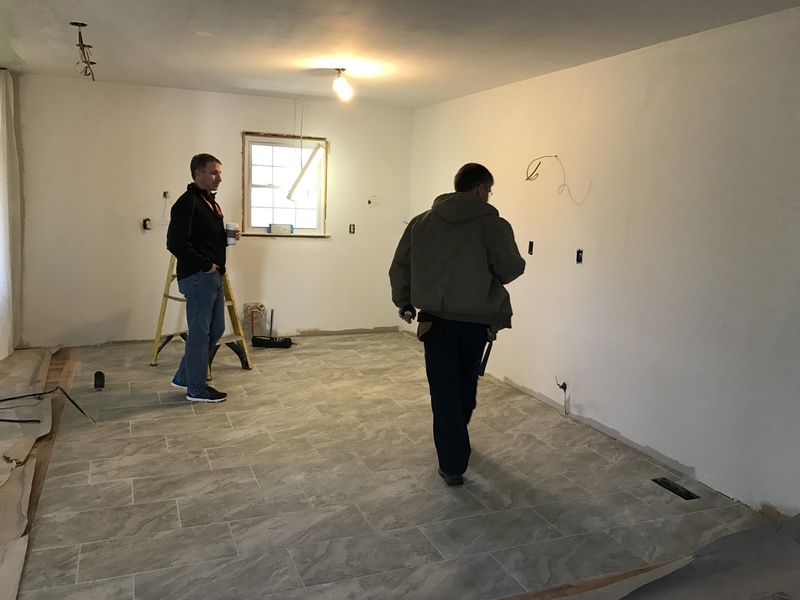 On Thursday, 03/16/2017, Seth Valentine, Rob Wright, David Mashburn (one of our inside salesmen), my good friend and former partner in True32 Corporation, Mark Poole, myself and Art’s team of three converged on the Zelenka home (there were more cabinetmakers than cabinets in the house) to install the cabinetry. The reason for all the Cabinotch folks being there was to teach and document the process. 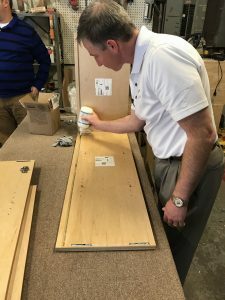 Most cabinetmakers have little or no experience with Leg Levelers and the Suspension system we use, so we decided to help them out and familiarize them with these systems. 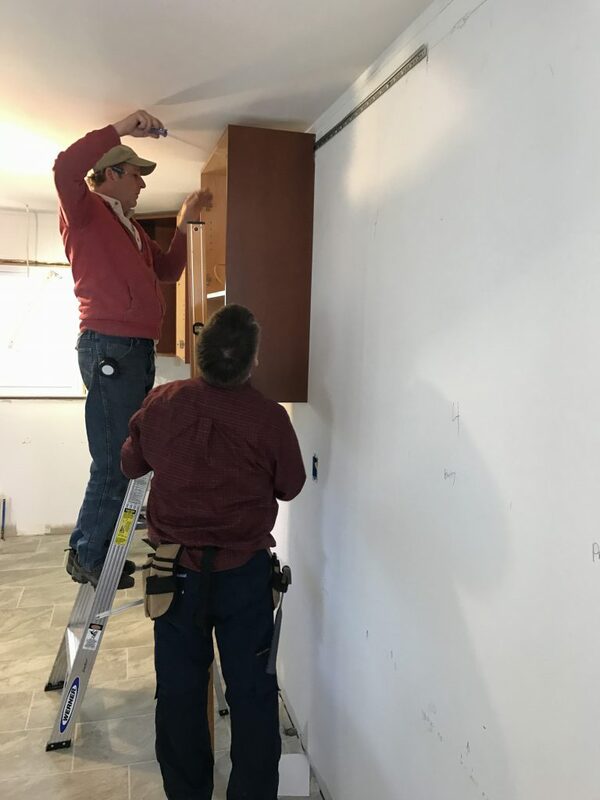 I was so thankful for Art’s key guy Mike not only being a great cabinetmaker, but also having an open mind (far too many of us cabinetmakers lack that particular attribute), he embraced the suspension system and mastered it in just a few minutes. Likewise for the leg leveling system. He did whine a little about a sore thumb and mentioned Lamello’s under his breath in the same sentence. 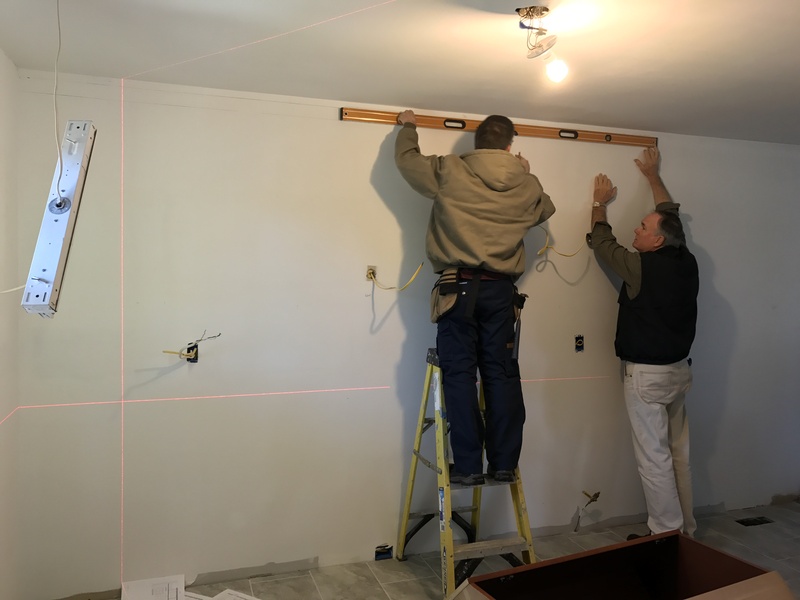 So it seems the job went extremely well, no issues with anything fitting, floors were relatively level, walls on the other hand, well let’s just say that Plumb and Level were not part of that equation. The suspension system did a great job of allowing us to deal with an out of square corner and pretty significant bows and humps in the walls (anytime you cover up a window and patch the sheet-rock, there will be significant humps and bumps in the sheet-rock). So it seems everyone was happy at the end of the day, and to celebrate Job #1, Rob brought CAKE (all great accomplishments in life should be celebrated with cake). 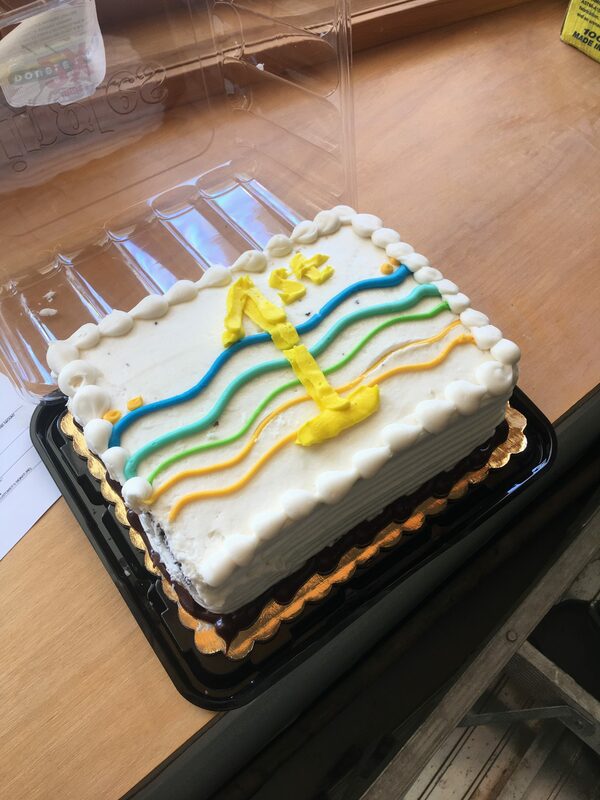 But typical of any competitive salesman, Rob did not have the cake inscribed with Job #1, he had them inscribe it with 1st, as in he being the salesman that brought in the 1st Cabinotch Full Access cabinet job. I bet you can guess what he did right after we all ate cake? Yep, you guessed right, he sent all the other salesman a picture of the cake, and rubbed it in real good. 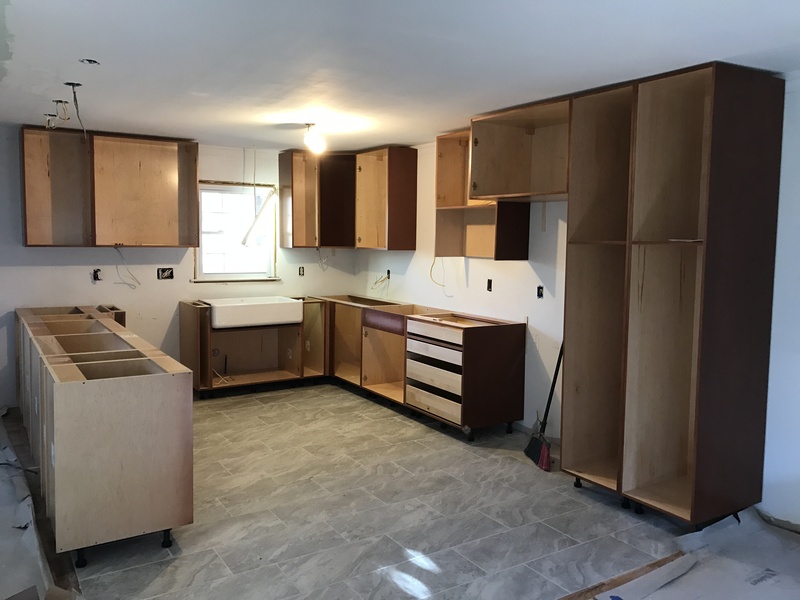 So there you have it, Job #1 installed and ready for countertops, peninsula back, applied end, doors, drawer fronts, frieze mold and crown mold. 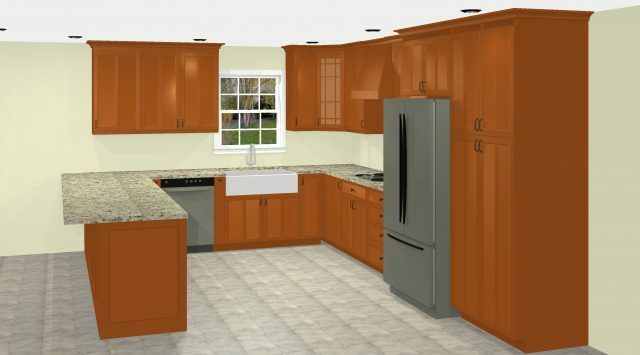 A beautiful kitchen utilizing the Cabinotch Full Access cabinet system. 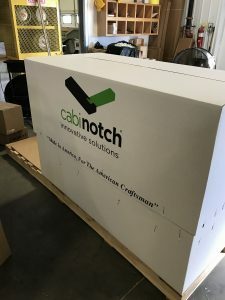 If you struggle with getting and keeping good employees, and/or with mistakes throughout the manufacturing process, why not give Cabinotch a shot? If you have great employees, great systems and processes that remove the opportunity for mistakes from your processes, and everything goes great at your shop, why not consider Cabinotch to add even more great projects each month, adding additional profit to your bottom line. If you’re already a Cabinotch customer, and using the Cabinotch Library for KCD, keep an eye out for the new Cabinotch Full Access Library to show up in your copy of KCD in the next week or two.  If you are not currently using KCD, give your salesman a call and let him tell you how you can get setup with KCD and all three of our Cabinotch Libraries for KCD.